If you’ve never gardened before, or are starting a brand new garden, here are the three things you must consider before you begin. Thing 2: Soil. This makes all the difference in the world. Almost all yard soil will need some work to get it to the fertility you…and maybe you don’t even have a yard. Advanced gardeners will build their own soil, but for starting out, my preferred way to go is to build raised beds and buy good soil. Get it by the cubic yard from a landscaping company (one yard per 4’x8′ bed) It’ll be called “garden blend” and will have half dirt and half compost. You can buy bags of soil and compost at the garden store, but you will need a lot of bags to fill a 4’x8′ garden bed. Thing 3: A container. Raised beds at least 2′ square and 8″ deep are ideal. I like 4’x8′ beds. Lumber generally comes in 8′ lengths, so you can create one from three planks with only one saw cut. I can also reach across a 4′ bed without stepping on the soil. You can also plant in BIG portable containers. Here are a couple ideas: an 18 gallon Rubbermade tote; the bottom 12″ of a plastic trash can; a 5 gallon bucket (fits one tomato plant); or a plastic wading pool. You can also buy 18″x24″x12″ self-watering plastic planters for $75 if you’re feeling gear-happy. (Here’s my favorite source.) Just keep in mind, anything smaller than a 5 gallon bucket is going to require lots of fussing and careful attention. Important: Any container must have holes in the bottom for drainage or your garden will probably drown. Plunk your container in its new home and mix your soil and compost in it. I suggest putting half the soil in, mixing it up, then continuing to do layers and mixing in batches. It’s hard to mix a hundred pounds of dirt at a time. Thing 4: Water. Chances are, you’ll need to water thoroughly one or more times per week. The smaller your container, the more often you have to water. A 4’x8’x12″ deep bed needs water once a week. A 6″ flowerpot needs water twice every single day. Having good equipment (I like a garden hose with a fan-type nozzle) means you’re more likely to give the garden the water it needs. It’s not too late to start a garden! Hi Emily! I just found your blog…thanks for this great post. I have tried and tried to garden, and I will try again this year! In fact, I’d like to do a mini-garden in my classroom, so that my kids get a better idea of where food comes from. (I teach in Detroit, and none of the kids’ families have gardens 😦 ). At the very least, we’ll plant some herbs or something! I’ve already got five folks on the line, but I can probably hook you up with some school gardeners in the area…you interested? Love the site, especially the practical advice on gardening…………. 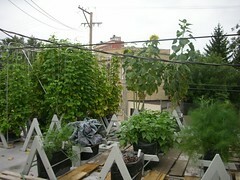 A few of us who live in the city of Chicago are trying to grow heirloom vegetables on our rooftops in cheap homemade earthboxes. It sounds more than a little preposterous to suggest that what we’re doing is a real solution to the huge environmental problems in front of us, but it might be a tiny piece. We think they’re a great way to build connections in a fragmented social/political landscape. Not selling anything, I’m giving “it” away. Here’s the Flickr link, along side the pics is a little how-to guide with plenty of links. Bruce – This is *beautiful! * What are you growing vertically – is that squash of some kind? What a great use of otherwise wasted space! We’ve been fine, it just takes a little longer for things to fruit. I’ve remedied this a bit by tending to choose, for example, tomato varieties that produce pretty quickly. I’ve also added large pots scattered about that I can move around or position in strong light. There has been no shortage of produce from our garden, and things like lettuce, kale, and the herbs are all pretty happy, too. Just something to keep in mind. looking to start a veggie garden but still have not found any one that has some extra seeds to start a garden ,If their is anyone withsome extra seeds plzs e-mail me and I’ll forward my address where they can be sent thank you. Thanks for the great information. I’ll be starting my vegetable garden this year. Thought the wading pool idea is kinda neat. I wonder how many have used that method. Good way to recycle those old plastic pools. I’ve used the wading pool idea, had hubby put a few holes in the bottom of it for drainage and it worked great! 🙂 happy garden’n everyone! Great tips! What do you recommend for organic pest control? I found this organic spray online called EndAll. Have you heard of it? It targets a large range of insects and kills them at all stages of their life cycle. Honestly? I don’t have enough pests to worry about. I use row cover to “exclude” cabbage moths. I wash aphids off with water before I eat the plants. I’ve only had squash beetles once. I plant bush and pole beans, and the Japanese beetles eat the pole beans (in bad years) but leave the bush beans alone. There’s enough to share, and no need for even “organic” sprays.